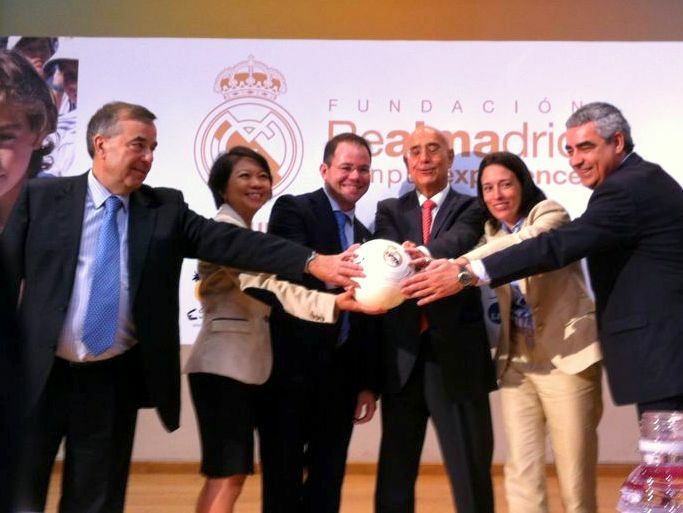 On Thursday, 11 April 2013, The Realmadrid Foundation (Spanish: Fundación Realmadrid, FRM) announced its plans to partner with Raffles Institution to bring the Realmadrid CampusExperience to Singapore and Southeast Asia. These plans were announced via a press conference held at the Multi-Purpose Hall at RI (Y5-6), attended by (from left): Mr Joaquim Sagúes (Worldwide Director of Campus Experience), Mrs Lim Lai Cheng (Principal of Raffles Institution), Mr Sergio Cervantes (Realmadrid CampusExperience), His Excellency Federico Palomera (Ambassador of Spain to Singapore), Ms Gabriela Martinez de Aragon (GM of BBVA Bank) and Mr Manuel Parreño (Worldwide Director of FRM’s Clinic Programme and Technical Academies). An opportunity for budding boys and girls aged 7-17 keen on pursuing football in the region, the Realmadrid Campus Experience will also provide like-minded Rafflesians and other young footballers a unique opportunity to work with and learn under coaches from one of the most successful teams in football history. More than 100 participants have already signed up from countries in the region such as China, Hong Kong and the Philippines. However, the programme does not solely provide a footballing experience. “What sets this programme apart from the rest (other football training camps),” says Mr Cervantes, “is that we mix football with education.” The balance is found in a value-based education, focusing on the ideas and beliefs that Real Madrid and FRM pride themselves upon, including leadership, teamwork, humility and respect, to name a few. On the philanthropic front, FRM seeks to raise funds to sponsor at least one kid for each camp held in the summer, in what H.E. Palomera hopes will be a “small step” in helping the community to be passionate about football as a sport, and as an experience. The Campus Experience hopes to attract children of different socio-economic statuses around the region. During the press conference, H.E. Palomera mentioned how he saw Real Madrid as the “epitome of excellence in football”, and viewed Raffles Institution as of a similar level within the Singapore education system. The team in charge of the programme also felt that Raffles was equipped with the facilities they needed to carry out their camps. The CampusExperience will make use of the fields at RI (Y1-4), which will hence serve as the base for their annual camp. From the Raffles perspective, Mrs Lim exclaimed, “Who can resist Spanish football?” (Before adding: “And I stop short of saying [Spanish] footballers.”) Diving deeper, Mrs Lim felt that a collaboration with Real Madrid was suitable due to similar aims. This was so not only in terms of overall excellence but also in RI’s and Real Madrid’s shared values. She noted how FRM and the CampusExperience’s goals of “raising funds (and) supporting regions and communities and kids who are disadvantaged to allow them that kind of training experience” were in line with “what Raffles has been doing: social responsibility” In exchange, a Gap Semester element will be introduced for RI 1-4 boys, some of whom will have the opportunity to travel to the Spanish CampusExperience site. Clinics will also be conducted by coaches from Real Madrid for the football teams and other interested (and fortunate) participants. H.E. Palomera expressed that Raffles has become the “byword for sporting excellence”. The Foundation’s worldwide director, Mr Sagúes, was also happy about working with Singapore and “happy to cooperate with RI”. It was agreed by both Mrs Lim and the representatives from Real Madrid that this was going to be a “long-term project”, and that both parties were excited to begin what they hope will be a long-standing partnership between Raffles Institution and Real Madrid. Given RI’s history of sporting excellence and support from the E W Barker Institute of Sports, your correspondents have no doubt that the partnership will promote friendship and cultural exchange, and that the camp will live up to its promise of providing a holistic football education. It was quite a day for the rhythmic gymnasts who took on the National Inter-School Championships 2013 on Friday at the RI Gymnasium, many of whom were competing for the last time. In particular, three gymnasts Daphne Chia, Phaan Yi Lin, and Cecilia Chia swept the table by clinching the top 3 positions across all four events.